Available in: Black, Blue, Green, Orange, Purple, Red, Royal Blue, White, and Yellow. 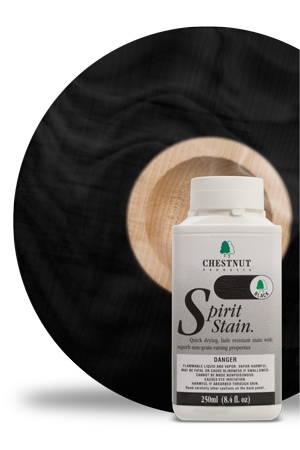 Spirit Stain Rainbow Colors are a quick-drying wood dye manufactured with high grade, fade resistant materials. It can be intermixed for colour matching or thinned using Spirit Thinners or Cellulose Thinners for delicate wash effects. It Can be applied with cloth, brush, spray, or foam brush. Tips: Ensure wood is clean and dry before use. All colours can be intermixed or thinned for delicate wash effects. Safety Considerations: Highly Flammable (see Safety Data Sheet or warnings on can for full details). 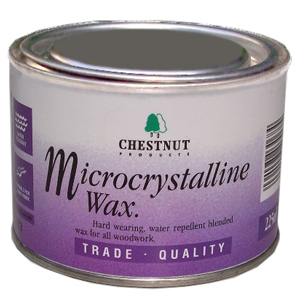 Method of application: Apply by cloth over sealed timber, allow to dry and buff to a high shine. Can also be used on the Buffing System - apply the wax to the item and buff using Wheel C.
Tips: Use very sparingly - a little goes a very long way! Safety Considerations: Flammable, being solvent based avoid skin contact as much as possible. (see Safety Data Sheet or warnings on can for full details). Used to re-touch damaged gilding on frames or furniture. It can also be used to gild new surfaces by using it over Fontenay base or gilt varnish. Apply with a finger or small, black bristle, square top brush. Leave matt or buff once the wax has dried. Use as a grain filler for some striking effects. 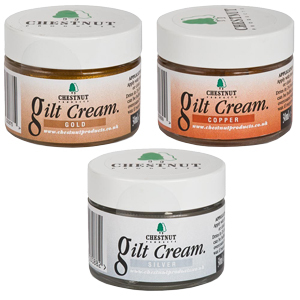 Supplied in 30ml jars. Available in gold, silver or copper, but colours can be mixed to acheive the desired result.